As part of our building project we received a grant from the Department of Arts & Culture to commission a work of Art for the school. This grant was 1% of the cost of building the school. The school’s Board of Management held an open competition inviting interested artists to apply for this commission. The Board of Management in conjunction with the school staff proposed to commission a work of art which would be positioned to the front of the building and although no specific theme was prescribed it was suggested that the piece should make a strong visual statement about the school. There was great interest in the commission and we received well over 100 applications for more information and 49 artists made formal submissions for the project. 4 artists were shortlisted by a selection board (consisting of 3 professional artists & 2 members of the Board of Management) and they were invited to present their proposed artwork to the selection committee. It was then down to the committee to decide which piece of work best suited our school. 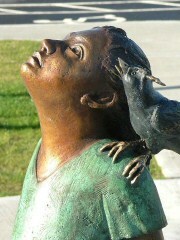 The Selection Board agreed unanimously that the commission should be awarded to an artist/sculptor named Fidelma Massey. The sculpture is called ‘Taobh na Coille’ or ‘At the Edge/Side of the Wood’. It consists of a bronze statue of a young girl standing at the edge of a wood. She gazes into the wood and looks as if she is just about to enter somewhere magical, fascinating and interesting. 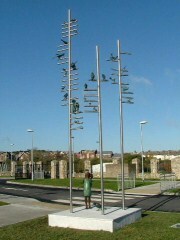 Three tall stainless steel poles depict the trees and each branch is a letter from the ‘ogham’ script that reads ‘Taobh na Coille’. 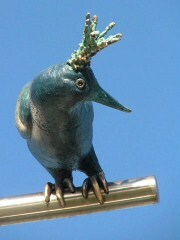 On the branches sit 32 fictional bronze birds of various sizes. It is clear from the expression on the young girls face that she is excited about entering the wood (or Taobh na Coille). 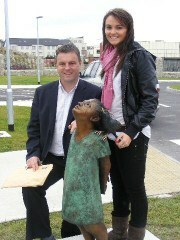 Our art commission was formally unveiled on Friday the 16th of October 2009. 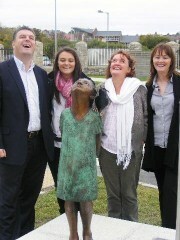 Pupils and parents attended the unveiling along with Fidelma Massey, our special guest on the day. We have named the sculpture ‘Clíona ag Taobh na Coille’ in honour of Máire & Lorcán Mac Gabhann, who founded Gaelscoil Thaobh na Coille and whose daughter Clíona was the first pupil enrolled to start in the school when it opened in September 1995. The Board of Management were so taken by the pencil drawings Fidelma Massey presented as part of her initial presentation for the % for art commission that the Board decided to commission a drawing of ‘Clíona’ and two of the ‘birds’ to be hung in the hallway inside the main entrance. 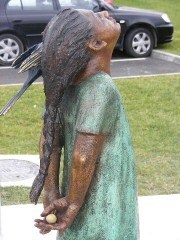 We are absolutely delighted with the beautiful sculpture Fidelma Massey made for us. It is a privilege to have such a wonderful piece of art in our school.